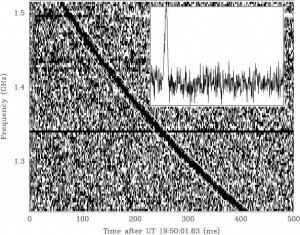 Over the last few years a population of millisecond-duration transient radio bursts called Fast Radio Bursts (FRBs) have been discovered, primarily at the Parkes Radio Telescope, as part of the HTRU (High Time Resolution Universe) survey. The first burst was published in 2007 by Lorimer et al, although the burst itself occurred some six years earlier — the burst was found in archival Parkes data. Their origin remains a mystery, with theories ranging from collapsing neutron stars at cosmological distances, to atmospheric phenomena on Earth. FRBs exhibit the dispersive effects of propagation through cold plasma, with higher frequencies arriving before lower frequencies (as shown in figure above). The dispersion measures seen can be explained by propagation over several Gpc through the intergalactic medium (IGM), and they offer an exciting means of probing this substantially ionised cosmological component for the first time — in effect “weighing” the baryonic component of the Universe. The “Lorimer Burst”, the brightest FRB seen to date, showing the characteristic highly dispersed pulse arrival time as a function of frequency. The Molonglo Observatory Synthesis Telescope (MOST), with its large collecting area (∼18,000 sq meters) and wide field of view (∼8 sq deg), and our UTMOST upgrade, are expected to vastly increase the rate at which we discover FRBs. 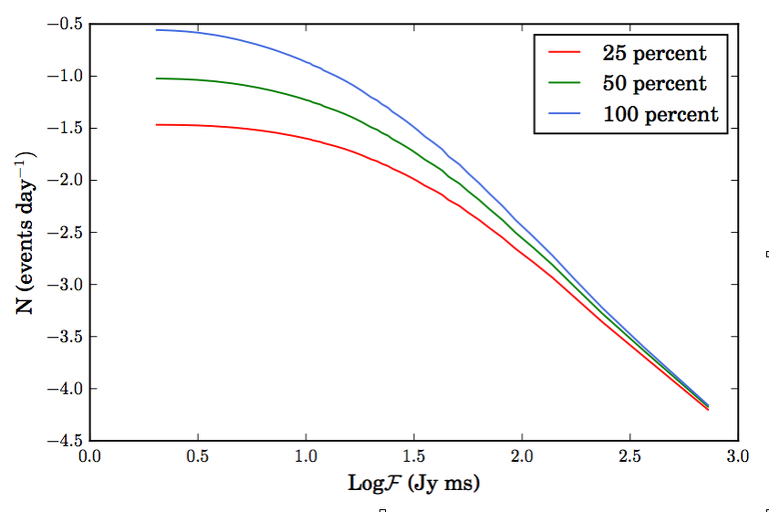 Radio transients – long term monitoring of extra-Galactic fields for slow transients. MOST is likely to be a very efficient tool for detecting FRBs. Model predictions for the number of events per day expected at Molonglo are shown below. The model assumes the events are at cosmological distances, that the dispersion measures can be used to estimate their redshifts, that they are flat spectrum sources, that they have a co-moving space density which is either constant or proportional to the cosmic star formation rate. Normalisation is made relative to the number of events seen at Parkes. We may achieve a detection rate as high as an event very two days. The log of the predicted number of events per day is shown as a function of FRB fluence (or brightness), for UTMOST utilising 25, 50 and 100 % of the final system sensitivity. The telescope upgrade currently (early 2015) has brought the system to approximately 10% sensitivity, with full sensitivity to be achieved by mid-2015. 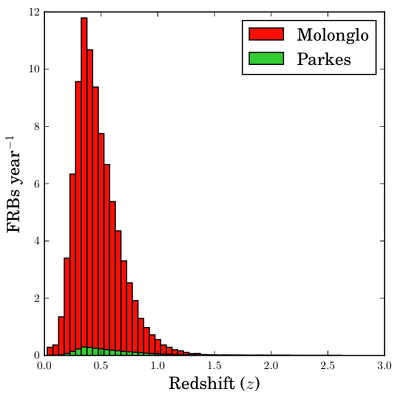 The number of events per year is shown as a function of event redshift, for Molonglo and Parkes, taking into account that we can search for FRBs with Molonglo 24/7, unlike our search programs with Parkes. Analysis indicates that at least 70 events at MOST are required to distinguish between a constant co-moving FRB density, and a FRB density that evolves with redshift proportionally to the cosmological star formation rate density, illustrating the need for increasing the discovery rate of FRBs markedly. Coherent fan-beams are created in the UTMOST using a brute-force algorithm that uses cache to achieve almost 100% occupancy on processing threads. These summed voltages are detected and integrated down to 0.65 ms timescales before being searched for bursts. The FRB search engine currently only operates on a handful of beams, and is slated to be upgraded through additional GPU purchases in Q1-2015 so that of order 1000 fan beams can be searched. In the figure below, we show detection of an individual pulse from the Vela pulsar as it drifts through the middle 3 of 5 adjacent trial positions on the sky, demonstrating we find pulses from different spatial locations in the telescope beam, an important milestone on the way to processing multiple fanbeams.